I enjoyed a blue fillet, bean-bag in consistency, with gorgonzola sauce last night at 'La Mimosa', Cambridge. In its previous incarnation the venue was a jauntily violent pub, although gentrification has thankfully re-established it as a peaceful, wholesome Southern Italian eatery. I liked the quirky LCD screen by the bar, bringing kitchen activity into the dining rooms. The wrap-around river view is also a magnificent bonus providing that "will they, won't they fall" anticipation whilst watching amateur punters steer by. Whilst communicating to my parents my intention to try my luck in California end of April, initially for 6months (permits permitting), Angelini's 'La Villa' Vino Nobile di Montepulciano '01 (not to be confused with pizza fayre, Montepulciano d'Abruzzo) was reassuringly Tuscan-warm, solid and giving. Chardonnay Grappa, from Frattina, smelt how I would imagine frog-spawn to, but delivered a more muted mouthfeel than the Moscato version. 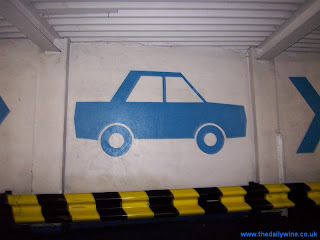 Pictured, a Mr. Magoo car stencilled onto the wall of the nearby car park in Park Street.